I have to admit the deepest interviews I have ever had have been with author Mark Nepo. In my recent interview with him about his new book ” The One Life We’re Given” we explored together how to reach and listen to our soul’s calling. As Mark states “Throwing ourselves wholeheartedly into what we’re given brings us alive”–whether we must deal with suffering, pain, fear and loss or surprise, beauty, love and wonder. Each of these moments is an opportunity to listen more deeply to our feelings to deepen our connections with others, and to sense the sacred nature of ordinary things”. On this journey we will affirm how precious this one life is and enter the chance we have to be fully alive and to be of us to each other and the world. We will uncover, how by loving what’s before us and concentrating on what’s particular and personal, we can begin to make sense of our experience. We will learn how, over time, the twin callings of enlivening our soul and enlivening the world become one, and how our sincerity and labor help us survive and thrive. If you are questioning certain life events from relationships to work, then you will want to read “The Life We’re Given“. This book is a practical way to reevaluate your life, and find ways to change it for the better. It will make you think deeply, reflect and listen to your soul. If you are longing to make your life better, the answers are right in front of you—the secret is to listen and connect to your soul then take action on your new found insights. I hope you enjoy this wonderful interview with author Mark Nepo. If you want to learn more about Mark please click here to be directed to his website, you can also connect with Mark by clicking here to be directed to his Facebook page. 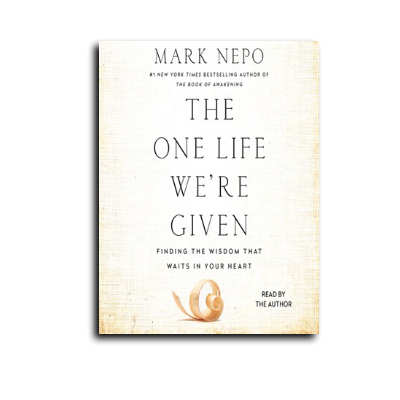 Enjoy another great podcast with author Mark Nepo.